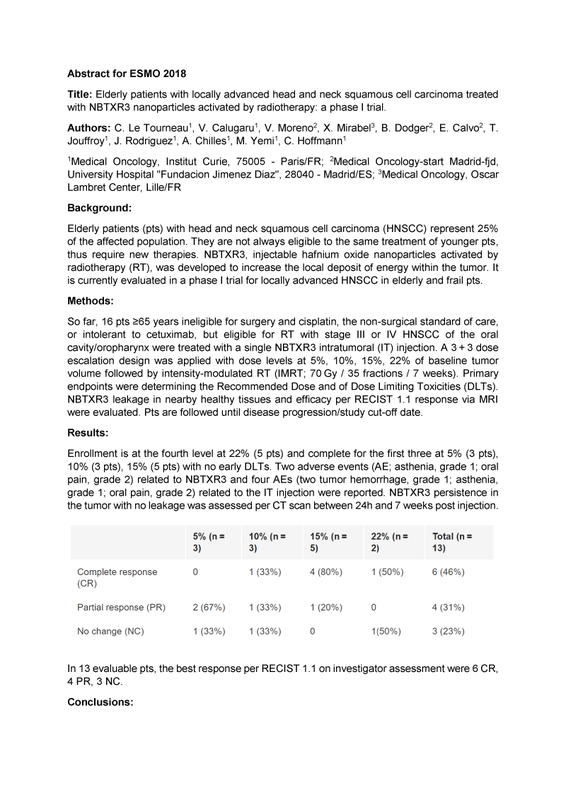 ESMO, Munich · 2018, Le Tourneau C. et al. Elderly patients (pts) with head and neck squamous cell carcinoma (HNSCC) represent 25% of the affected population. They are not always eligible to the same treatment of younger pts, thus require new therapies. NBTXR3, injectable hafnium oxide nanoparticles activated by radiotherapy (RT), was developed to increase the local deposit of energy within the tumor. It is currently evaluated in a phase I trial for locally advanced HNSCC in elderly and frail patients. Current results indicate a safe and well tolerated profile for NBTXR3 even at the highest doses highlighting an encouraging perspective in the elderly. This population stress a medical need of which few HNSCC trials answer.